Cliodnha, known as the Queen of the Banshees, or Queen of all the Fairies of the HIlls, is part of the Tuatha Du Danaan, subject to the Goddess Danu. Cliodnha presides over Tir Tairngire, or the Land of Promise, a place of happy feasting, with no aging, violence, death or decay, which some say is the Celtic Otherworld. She has three colorful birds, who eat apples from a tree in that Otherworld, that can heal the sick with the beauty of their song. She is a Goddess of love and beauty. She would take the form of an enchantingly beautiful human woman and use her beauty to take many mortal lovers. She was associated with light and happiness, but with a dark edge because when we was done with her mortal lovers, she would sometimes lure them to their deaths by the sea. She fell in love with a human man named Ciabhan, and wished to be with him. 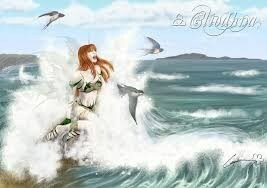 But she was lulled to sleep by the music of one of Manannan mac Lir’s minstrels, and was swept away by a wave. She is said to rule the ninth wave of every series of waves, which was larger than the preceding eight. Large waves are knows as “Cliodnha’s Waves”. One of the best known stories of Cliodnha is when Cormac mac Carthy asked her help in a lawsuit in the 15th century. Her advice to him was to kiss the first stone he saw in the morning. He did so and easily won his court case by the eloquence of his speech. This stone is the famous Blarney Stone. Cormac mac Carthy was so concerned that everyone would kiss the stone and the land would become a home to those who “could deceive without offending”, that he hid the stone in his castle, where it is to this day. 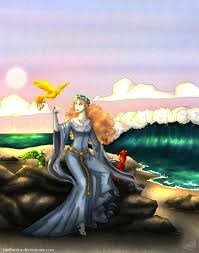 Cliodnha resides in her palace in the center of a sacred hill in County Cork, called Carrig Cliodnha. May the blessing of Cliodnha be with you.